Deep blue flowers with light yellow markings peeping out dense light green foliage. This is another flower which attracts butterflies of the winged variety. 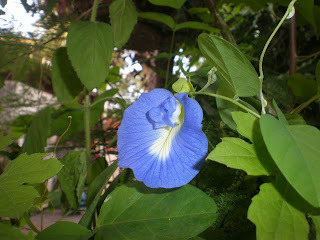 The blue butterfly pea (Clitoria ternatea)is more common than the white one. It is a perennial, herbaceous vine mostly grown on fences. The leaves are pinnate with 5 to 7 lobes and give good foliage. The botanical name Clitoria relates to the shape of the flowers which are almost 2 inches long and borne singly. The term ternatea comes from Ternate, a cone shaped island in Indonesia. The flower is typical to the pea family (Fabaceae/ Leguminosae). Its shape has inspired some of the regional names. It is called Butterfly pea, blue pea vine, mussel-shell climber, pigeon wings in English; Aparijita in Hindi and Gokarna or less commonly Shankhpushpa in Marathi. I grew this plant from seed. It requires moist soil with partial sunlight. It grows very fast and flowered within the season. It is flowering again after taking a rest from the blooms during the monsoons but is mostly covered with light brown pods. Some of them keep popping to scatter the black seeds. The plant has to be constantly pinched back to encourage growth. I found some interesting uses of this plant. Extracts from the root and the flowers have a range of antimicrobial activity and is used in ayurvedic medicines. The extract contains biologically active peptides called cliotides which have potential to be lead compounds for novel antimicrobial and anticancer agents. Wow! It is used to strengthen hair, improve eyesight and enhance immunity in Thai medicine. In fact in eastern Asia, butterfly pea extract powder is readily available for consumption. The roots fix nitrogen, hence it is used for improving the fertility of the soil. In Burma the flowers are dipped in batter and fried . The pods are edible when tender. I have not across any recipe which uses this, but maybe it can be cooked the same way as beans. The flowers can also be used to color food; grind the flowers with water or milk to get blue or with little lemon juice to get red color. Of course very few recipes call for blue color. Someday I will try this. Till then I prefer to watch the butterflies! Thanks for visiting my blog. Love that Shanku pushpam. The flower is very pretty, so unique. But I must say I got a little tired of pruning the plant. It grows so well, with hardly any care. Sometimes even that can be a problem, especially when container gardening.